This DVD presents every round of competition through to the final posedowns and awards and Overalls. Includes all routines from the Posing Round. Natural Bodybuilding, Figure & Physique Titles. 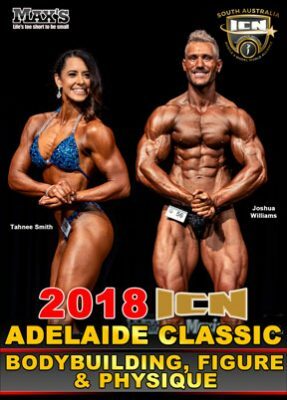 The 2018 ICN Adelaide Classic Bodybuilding Show was the first of 2 events held at the Norwood Town Hall on Sunday, April 22nd, 2018. Professionally run by Kim Tanska and his team, this event was another great success for the ICN organisation in South Australia. The special trophy presenter on behalf of major sponsor Max’s was Tony Torcasio. It was Joshua Williams who swept the field and claimed Overall Men’s Bodybuilding and Most Muscular titles. The Overall Women’s Figure Class Champion was the beautiful and shapely Tahnee Smith. Men’s Physique winner was Scott Pointon. Bodybuilding, Figure & Physique Show.